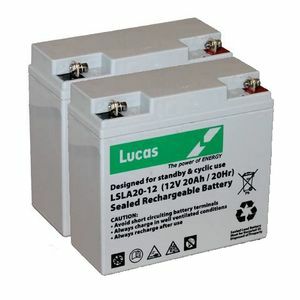 I am happy with the batteries and the service provided. Thanks. Parfait ! J'ai deux onduleurs APC Smart-UPS 1500Va qui utilisent ces batteries et pour le moment c'est parfait. A voir dans le temps. Livraison rapide et soigné comme toujours. 48 hours from ordering to batteries being delivered. Now the scooter lasts longer on a charge than it ever has. Arrived really quickly, batteries were already fully charged so was no waiting around. Excellent product. Will definately buy again. Excellent. I've used the LSLC22-12 (the LSLA20-12's cyclic cousin) as a jump starter battery in the past with no issues (replacing the fake 7Ah-in-a-17Ah-case found in my Nikkai jump starter) and have recommended them to others both for jump starters and for a golf caddy. I didn't hesitate in picking Lucas again, this time for an alarm panel (yes it's a big panel) and a UPS. Good service as usual. Prices very competitive, delivered quickly. Only big downside was the use of lots of polystyrene which in this day and age is not eco friendly and could be substituted by recyclable product. Also was a pain to clean the bits off the cardboard packing so it could be recycled.